Seollal, Lunar New Year’s Day, is one of Korea’s main holidays. The holiday takes place around the first new moon of the lunar calendar and serves as a time for people to greet each other with words of blessing for the year ahead. During the holiday period, Koreans also participate in ancestral memorial services, bow to their elders, and play traditional games. To learn more about these customs, follow along with Kayla and Sebastian on their special visit to the Korea Etiquette Institute! As the saying goes, “a loaf of bread is better than the song of many birds.” The first part of Kayla and Sebastian’s trip was preparing a tasty lunch of tteokguk (rice cake soup). 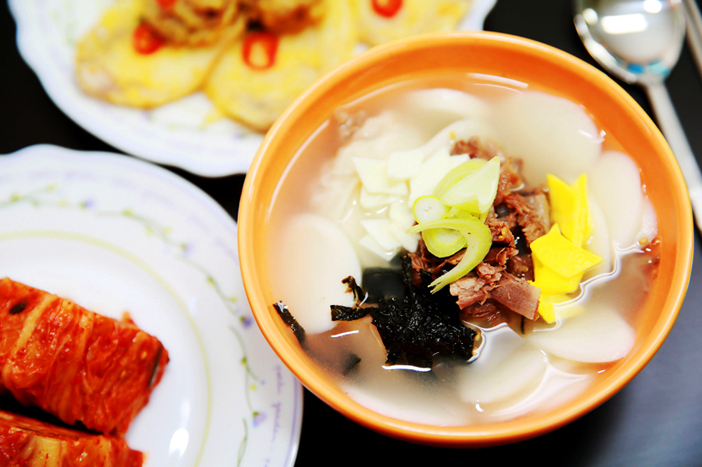 Tteokguk is one of Korea’s original dishes, and is traditionally eaten for the New Year. The dish is made by boiling thinly sliced white rice cakes in a clear soybean soup. Before eating, each bowl is garnished with meat, green onion, and egg; mandu (dumplings) can also be added for a more filling meal. On their trip, the teacher gave a simple tip to make the tteokguk taste even better! Before putting the rice cakes in the soup to boil, wash them with cold water and let them soak for about 30 minutes. This will give the soup a clear taste and look. Following the instructor’s guidance, Sebastian carefully prepared the rice cakes in the boiling soup while Kayla was praised for her artful use of the garnish. Kayla and Sebastian also prepared two types of jeon (savory pancakes) to go with the tteokguk. Jeon is made by lightly coating vegetables, meat, or slices of fish in flour and an egg wash before frying in a small amount of oil. Jeon can be eaten at any time, but it is customary to have them at Seollal and Chuseok (Korean Thanksgiving Day). The name of each jeon is based on the main ingredient, such as gul jeon (batter-fried oyster), beoseot jeon(batter-fried mushroom), or hobak jeon (batter-fried zucchini). 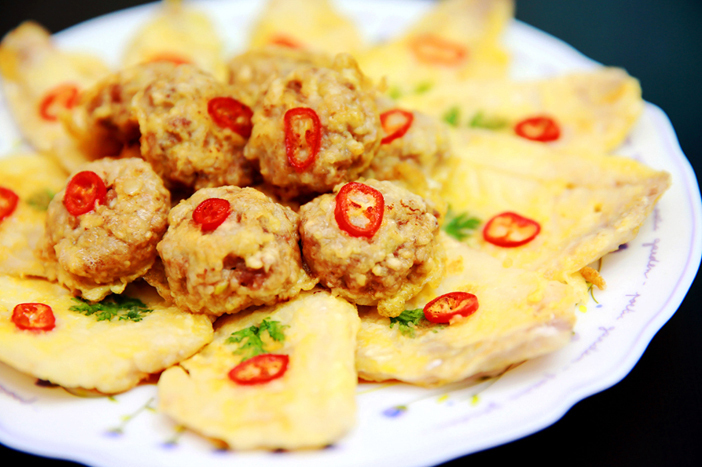 For this experience, they prepared dongtae jeon(batter-fried pollack fillets) and yugwonjeon (batter-fried meatballs). Kayla continued to show her artistic skills in garnishing, while Sebastian had the task of making sure the jeon were all fully cooked. Dongtae jeon is made by warming slices of dried pollack before marinating them in a mix of salt, pepper, and clear rice wine. After dabbing off any remaining moisture, the marinated slices are lightly coated with flour, dipped in an egg wash, and pan-fried over mid-low heat. Yugwonjeon on the other hand requires a bit more preparation. The meatball is made from mixing ground beef, tofu, garlic, and other seasoning ingredients together; the key to good yugwonjeon is making sure there is very little blood or water remaining in the meat and tofu, respectively. After mixing the ingredients fully together, it is rolled into small balls, lightly flattened in the palm of one’s hand, and then follows the same steps as dongtae jeon: flour, egg wash, fry! In order to fully cook the inside of the meatballs, keep the heat low. After lunch, Kayla and Sebastian were excited to try on hanbok. Korea’s traditional clothing, the design of hanbok has largely remained unchanged since the Joseon dynasty. While modern styles and imitations of hanbok have seen a rise in popularity recently, traditional hanbok is worn on cultural holidays and during memorial services. Kayla proudly admitted to being a hanbok maniac, carefully selecting her hanbok based on what colors and styles suited her best. This was the first time Sebastian had tried on hanbok since a trip to Jeonju years ago; he was most concerned with simply not wearing pink. 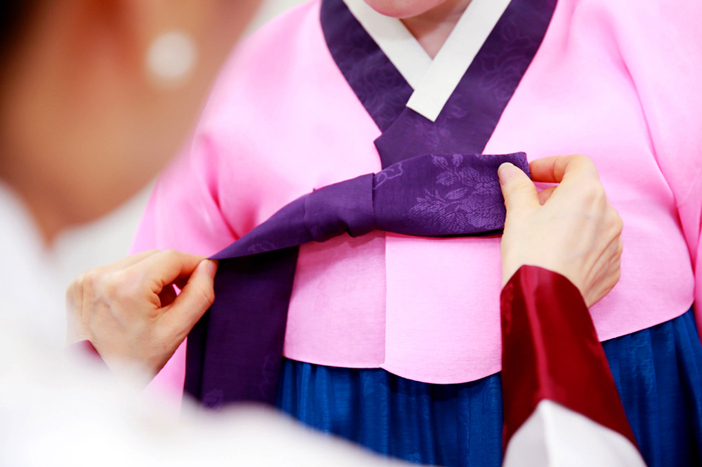 The most difficult step to wearing hanbok is correctly tying the goreum (ribbon). The ribbon keeps the jacket closed and in place, so it is quite important! While you could just make any type of ribbon or even a simple knot, doing it the proper way creates a beautiful finished image. To make the proper ribbon, cross the right-hand goreum over the top of the left before pulling it back up through the two to tie them together. At this point, place your left hand over the tie and wrap the top goreum once around your hand, down the back and up the palm. With your right hand, create a ribbon shape with the hanging goreum and pass it through the goreum looped over your left hand. After this, simply tighten and adjust to make it picture perfect. If you have tied the goreum correctly, there should only be about a 5-centimeter difference in the two goreum. After dressing in hanbok, it was time to learn the New Year’s bow. Both Kayla and Sebastian have lived in Korea for nearly ten years, so they are quite familiar with Korean greetings. Despite this, a simple standing bow is nowhere near as difficult to master as the full bow while dressed in hanbok! Kayla had difficulty not stepping on her skirt upon standing up again, while Sebastian tended to untie his goreum ribbon in the process. Families gather together on the day of Seollal, and all members will give a New Year’s bow to the elders of the family. The bow is different for men and women, but both must pay important attention to their gongsu (hand position). For men, the hands are held lightly in front of the body with the left hand over their right; for women, the right hand is over the left. The teacher praised Kayla for her correct hand positioning, not knowing she had previously attended a class on Korean etiquette. After a bit of review, the two were ready to bow! For the female version of the New Year’s bow, the hands, still held in the gongsu position, are lifted up to one’s forehead, while turning one’s head down to look at their feet. The hands will be held at this position throughout the bow until returning to the first standing position. At this point, the woman lowers her body slowly and kneels, starting with the left knee and then the right. From here, she sits down fully and then bends forward at the waist to about a 45 degree angle for three seconds. From here, simply reverse the process, sitting up straight, kneeling, standing on the right foot and then the left, before returning both hands to the gongsu position. For the male version of the New Year’s bow, the hands held in the gongsu position are lifted up and out in a round motion to one’s eyes before being dropped down to the floor. Men also start kneeling with the left knee and then the right before sitting down. While women only have to bend slightly, men must bow further, lowering their backs to create a flat line. Their elbows should be placed on the floor and their forehead should hover slightly over their hands on the ground. If done properly, there will be a straight, flat line from the top of the head to the buttocks. After holding this position for three seconds, lift the elbows from the ground and sit straight up, place the right foot on the ground and use the hands in the gongsu position to push off from the right knee. 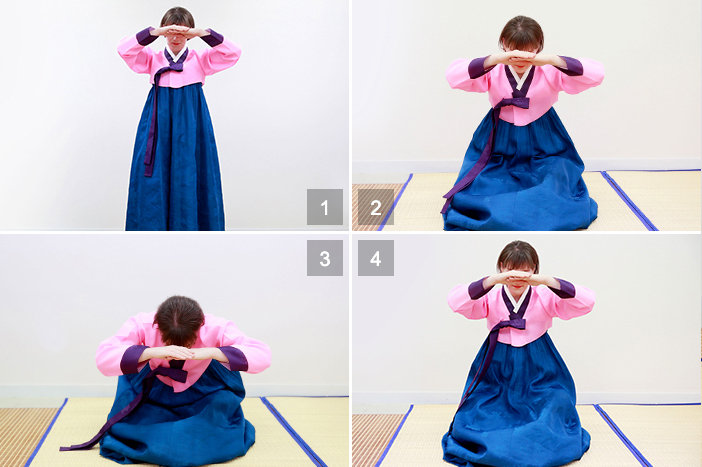 After standing, lift one’s hands to their eyes before returning to the original gongsu position. The last lesson of the day was playing yunnori, a traditional game that can be played by all! The game can be played with as few as two people; with more people, the players divide into two teams. Each team is given four game markers they must move around the board. The number of spaces they can move is based on the results of throwing four sticks in the air. The sticks are made of chestnut wood and have one flat side, while the opposite rounded side is marked with “X”s. The first team to get all four game pieces around the board wins! ☞ TIP) Looking to try some traditional activities for yourself? Plan a visit to Namsangol Hanok Village, National Folk Museum of Korea, Seoul Global Culture Center, Korean Folk Village, or Korea House! These locations have a variety of traditional culture experience programs to enjoy! * This column was last updated in January 2019, and therefore information may differ from what is presented here. We advise you to confirm details before visiting.